Fresh Health Wonk Review – David Williams has posted a packed & pithy edition of Health Wonk Review over at his Health Business Blog – get your biweekly fill of the best of the health policy blogs. Social media – Peter Rousmaniere has a roundup of some of the best workers’ comp social networking on the web at Risk and Insurance – we thank him for including us – check out some of the other resources! State comp agencies – Roberto Ceniceros posts about struggling comp agencies on his Comp Time blog, a followup to a more in-depth article about how states’ financial woes are squeezing comp systems that appeared in Business Insurance. The recession has decreased payrolls, adding further momentum to the drop in frequency and theoretically resulting in fewer claims to process. 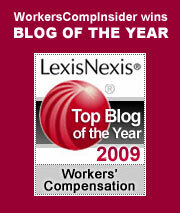 But some employers report that state work comp cutbacks are impacting their ability to resolve claims. Some risk managers say that the shortage of administrative judges means that claims take longer to resolve, hearings are delayed, and litigation costs are higher, among other effects. EBT cards spark suit – In Ohio, the Bureau of Workers Comp is paying workers comp benefits via a Chase debit card. A class action suit has been filed by employees who say that Chase is charging fees if they make more than one withdrawal a month. Many state agencies are using such cards for food stamps and other social programs but we were unaware that they are being used for workers comp. As one of just a handful of monopolistic states, Ohio is the exclusive provider of workers comp, so it makes sense that the state would want to cut administrative costs. Check out the 2004 white paper by the California Commission on Health and Safety and Workers’ Compensation: the Cost/Benefit of Implementing Electronic Deposit for Unemployment and Disability Benefits in the State of California. Heat wave – If the recent record high temperatures in the northeast are any indicator, it could be a long hot summer. The Texas Division of Workers Compensation reminds employers to prevent heat related injuries and offers a good check list of safety tips to prep for extreme heat. Workplace cancer – According to the World Health Organization, at least 200,000 workers die each year from cancers related to work exposures, such as asbestos, benzene, and second-hand smoke. Nearly half of those deaths – or 90,000 each year, are related to asbestos. Think that asbestos exposure is no longer a problem here in the U.S.? Think again. Implants and pharma costs – Joe Paduda has a few interesting posts related to cost items that can add to a claim’s medical bill. First, he looks at the often all-too-cozy relationship between physicians and big pharma. In another post, he suggest taking another look at the invoice for implants used in spine surgery, bone and joint surgery. The price tag can be hefty – adding 11-33% to hospital bills in California. South Carolina – does it seem like workers comp reform in South Carolina has been in the offing for an awfully long time? In the light of a recent NCCI recommendation that the loss cost level be increased by 23.7 percent, the Property Casualty Insurers Association of America is speaking out. Photo of the week – from the Naval Safety Center – Eyewash Yikes and Eyewash Yuk.